No pictures can do justice to just how hard and heavy the snow is falling right now in Kittery, Maine. Looking out over the now blanketed stream, the trees have shouldered their wooliest white sweaters and I can no longer see the high school or the ship’s harbor or the US Navy tower. It’s as if a curtain has been pulled over the stage and soon the entire theater will darken. My mom is the one who taught me about wabi-sabi because her own life has been a work of wabi-sabi. As a kid, she repaired roadkill frogs with band-aids, wrote her name as “Nutty Nancy” in the once fresh cement by the family’s in-ground pool; she has gone through her own ups and downs with relationships and marriages. Since I’ve known her, Mom’s become a nurse, a mother of four, a 10K runner, a shaman, and a singer in a band. As difficult as it can be sometimes, it’s also enlivening to see someone who never grows old, who continues to set ambitious goals; someone who embraces change even if that means enduring discomfort and criticism. 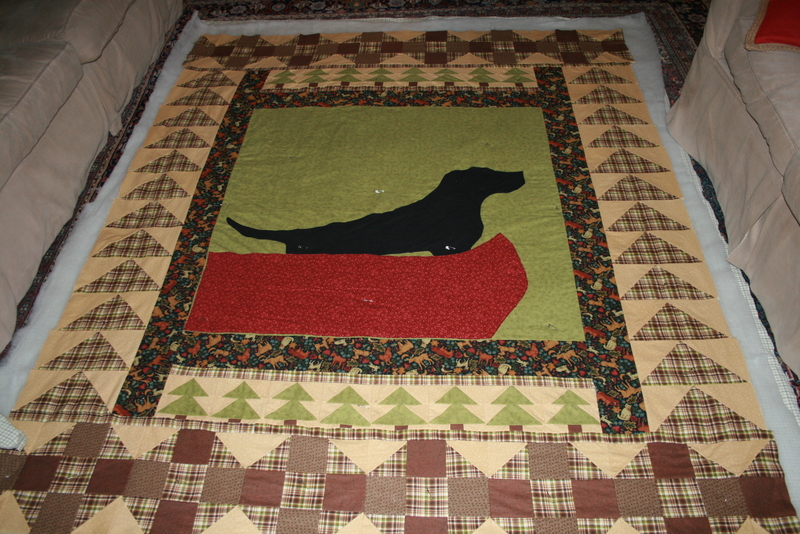 So, with quilting, Mom is not afraid of mess-ups. I’d like to think of her as the Bob Ross of our quilting world. Grammy was a different sort of character. To me, she seemed so in control and confidant. I always believed that she never made a mistake because I never saw mess-ups in her knitting or quilting or sewing. Despite her rocky upbringing in Southie, Grammy seemed to have the superhuman gift of pulling everything taut so you would never guess the fabric could wrinkle or fade. This past Girls’ Cabin Weekend, the first thing I did when I got to the Madison cabin was rummage for the two Grammy quilts that belong there. 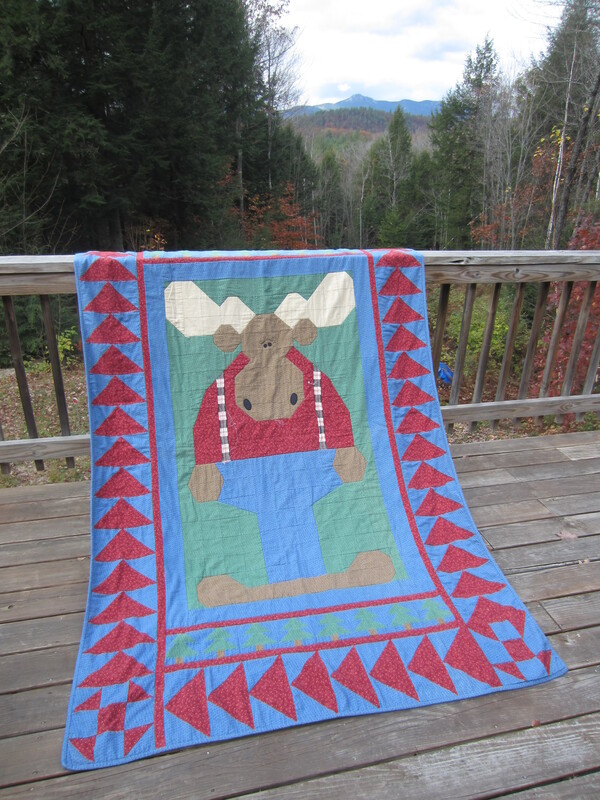 I could only find the moose quilt, and I put that one on my bed. 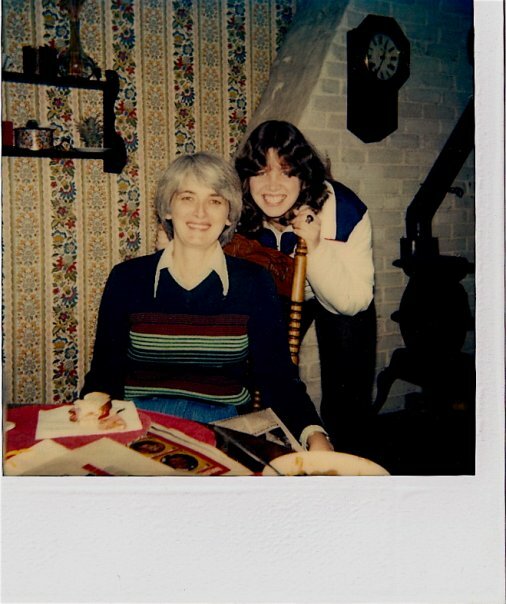 (Later, I learned that Auntie Kim – Mom’s Irish twin sister – had taken Grammy’s bear quilt to serve as model for a college quilt she was making her son.) 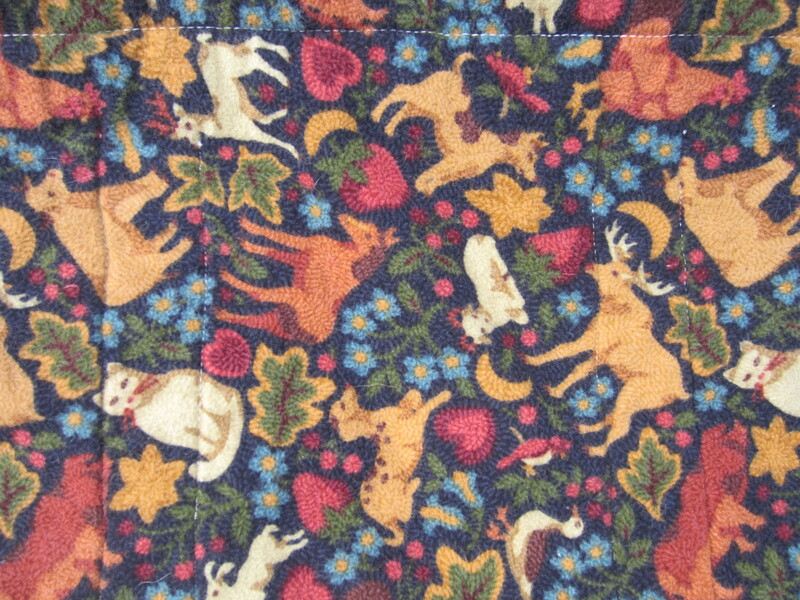 I just love how campy and folky Grammy’s moose quilt is, and it has a nice, brushed flannel touch to the fabric. Bringing it out onto the porch for pictures the last day, I found a mistake on the quilt. Grammy had made a mistake with one of the corner blocks. 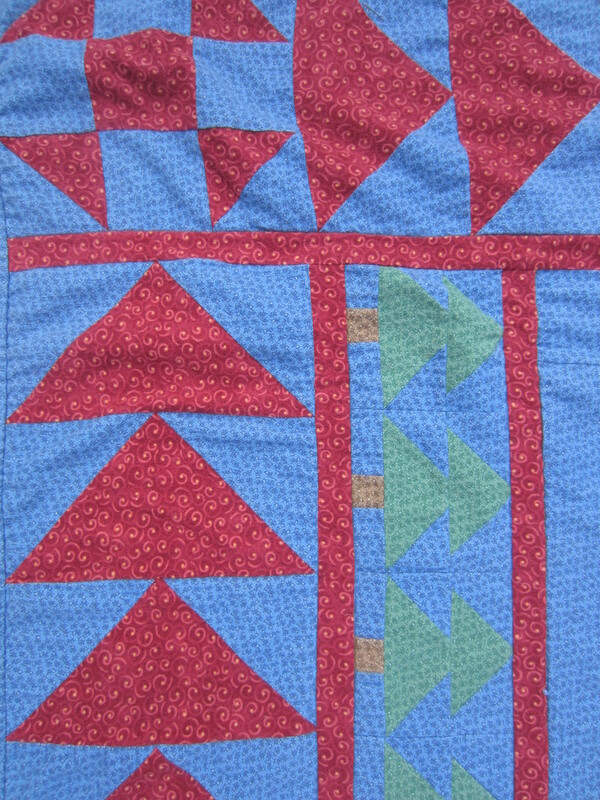 I touched the block as if running my hands over it would rearrange the triangles into the correct pattern. 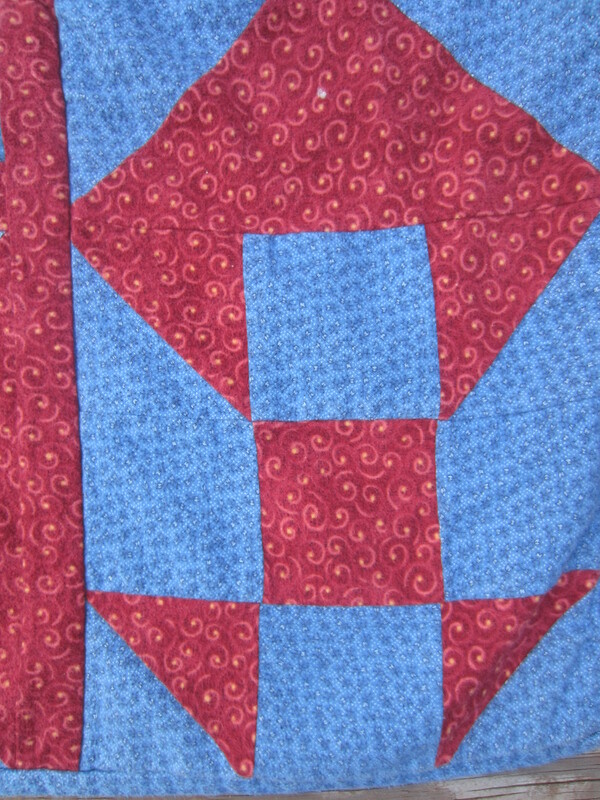 Why didn’t she correct this block before finishing the quilt top? It seems impossible to me that she didn’t notice it. So, did that mean that Grammy didn’t care to fix it? That maybe she let this block slide because she was okay with imperfection? It’s easy to believe that other people around you have it more together than you do. With so much upheaval in my own life, I often struggle with feeling like I’m two seconds away from being found out that I don’t have everything together — that I’m very much just a wabi-sabi work-in-progress. 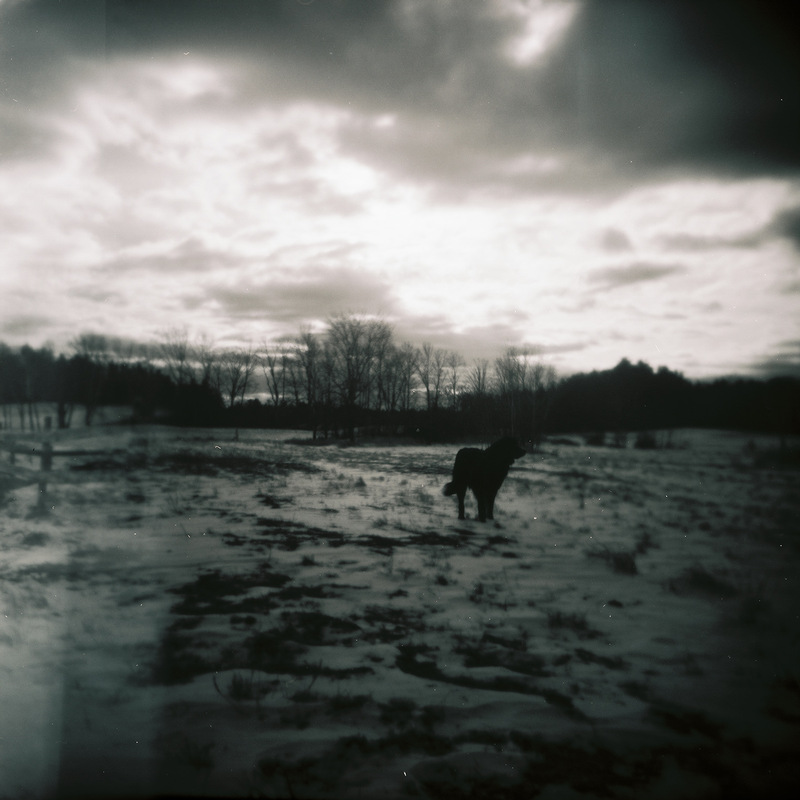 That October day when I found Grammy’s Amish square on the moose quilt, a picture that I held of her was irrevocably tarnished. Grammy wasn’t perfect after all. She was just another wabi-sabi work-in-progress like all the rest of us. But, like all wabi-sabi imperfections that we carry, Grammy’s small corner block, just two triangles shy of being perfect, only made me marvel at the person she truly must have been. Because it is good to be not always in line. Because it is good to be figuring things out as we go. 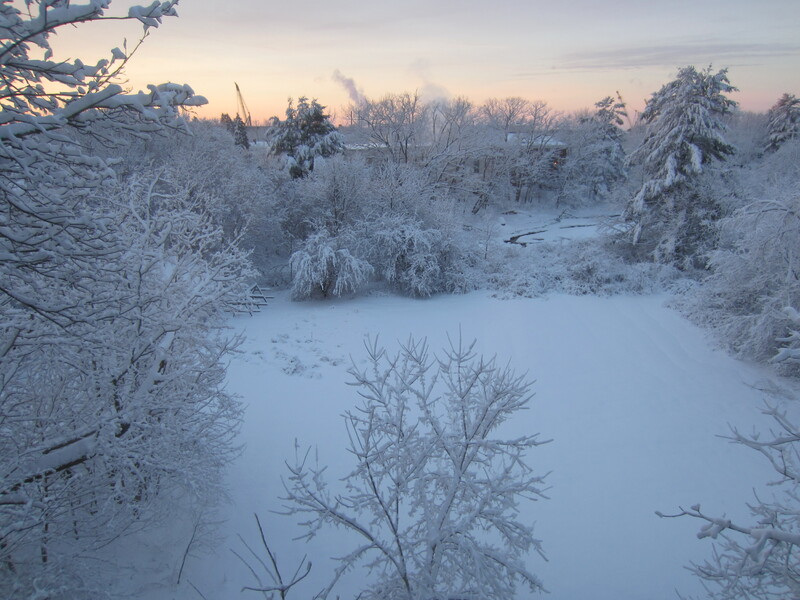 An update of sorts: Post-Snowstorm — This is what my Kittery, Maine backyard looked like on the morning of Tuesday, February 19th, 2014. Gorgeous, but my arms were sore from all that shoveling! Good morning, Kittery in February! Awesome post, Jessica! I love that you are embracing the wabi-sabi in you, and that you realize it is in all of us, no matter how hard we try to hide it. Actually, if we asked the people closest to us how they feel about our imperfections, they would laugh and say that is what makes us so special and unique, like a fingerprint. If only we could embrace our imperfections as gracefully. Wabi-sabi is a very good start! Love you! Beautiful thoughts and beautiful writing! 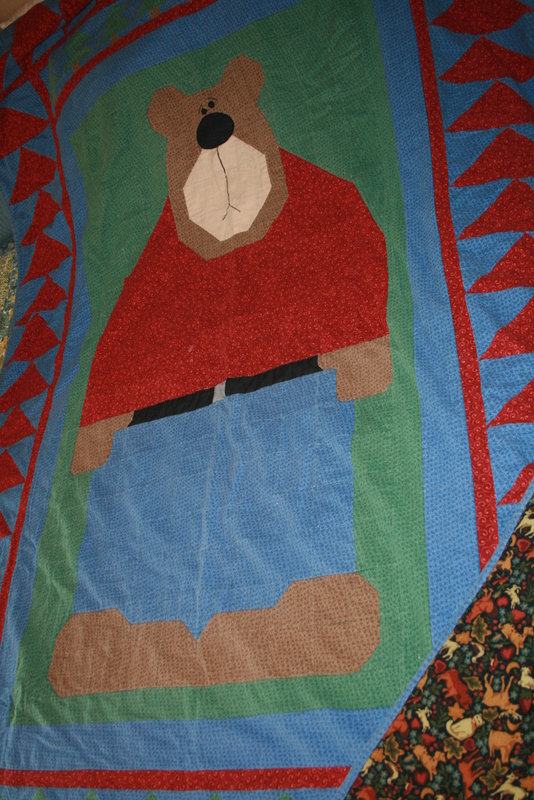 I love the bear and moose quilts and I always sleep with one when I am there!